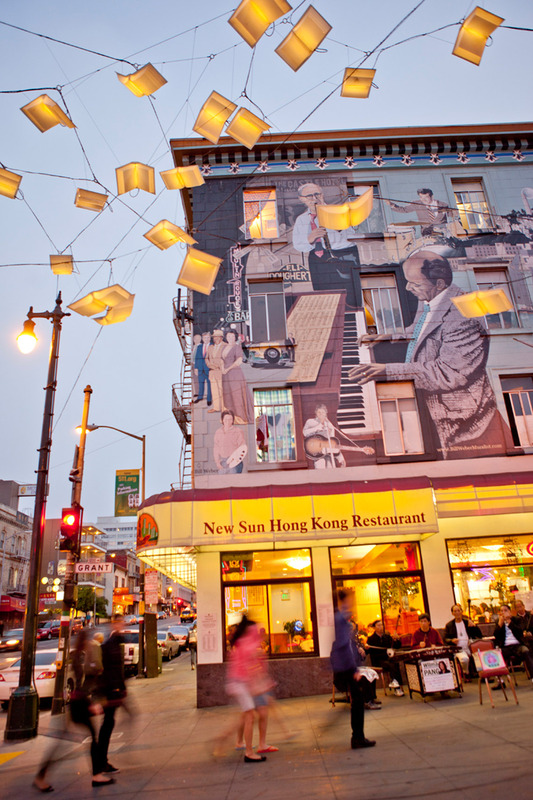 Famous jazz mural and a fairly new public art piece featuring flying books by Brian Goggin -- explanation from an article in the San Francisco magazine 7x7 explains the significance: ""Keep that in mind when his new site-specific installation (a two-year collaboration--commissioned by the SF Arts Commission--with local political activist Dorka Keehn) is unveiled this month above a new plaza linking Chinatown and North Beach, at the intersection of Broadway and Columbus. The Language of the Birds (a reference to the ancient Greek and Celtic mythical languages used to communicate with the divine) is a flock of 23 books suspended 15 to 30 feet above ground and arranged with their bindings open, as if in flight. For the sublime-spectacle portion of the program, the books, sculpted from white translucent polycarbonate and embedded with LED lights, will be illuminated from dusk till dawn using solar power from ad-hoc panels installed above City Lights Books. "Eventually, the goal is to take City Lights off the electrical grid," Keehn says. (Bonus points awarded for the project's eco-consciousness. )"..According to Goggin's website, http://www.metaphorm.org, the "fallen words" in the concrete are in English, Italian and Chinese to reflect the rich literary history of the neighborhood where North Beach and Chinatown intersect. Text from over 90 local authors, ranging from the Beats to Chinese poets and Italians, from the last 150 years are represented. The design on the concrete was actually created during a separate performance at the SFMOMA months ago, making this the first time SF's public art has included performance art. Check out Goggin's website for more information."